During my university years in Barcelona (a long, long, long time ago) I used to spend most of my time among books when I was not sleeping. Probably that’s why I enjoyed Heidelberg so much during our whirlwind tour around southern Germany. You will see why. 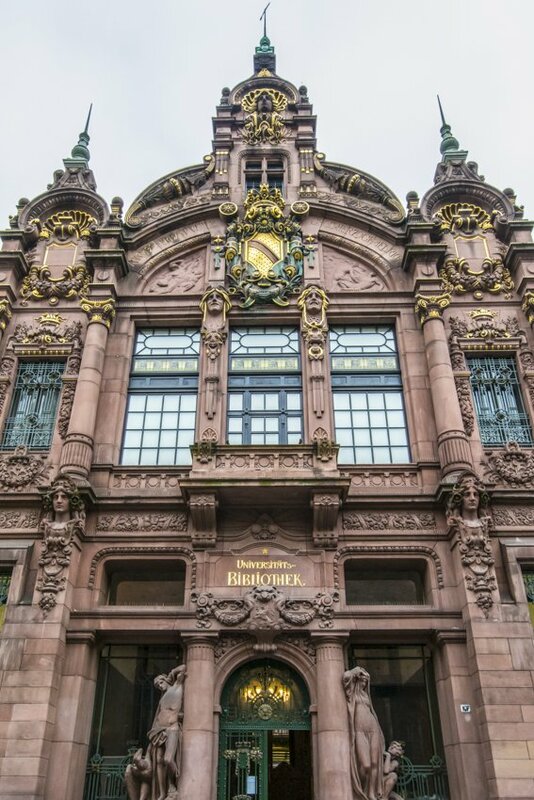 Twain was also very impressed by the old Heidelberg University and documented his passion in such a way that sparked the creation of sister universities even in the U.S.A. (John Hopkins University, University of California at Berkeley,…). At this point, I started to understand why I felt impressed by Heidelberg. So, let’s get practical now. Heidelberg is a town at some 90km or 56miles south of Frankfurt am Main, on the river Neckar. It hosts the oldest university in Germany which is internationally renowned and has a unique old university vibe with a cute and cosy feeling at the same time. 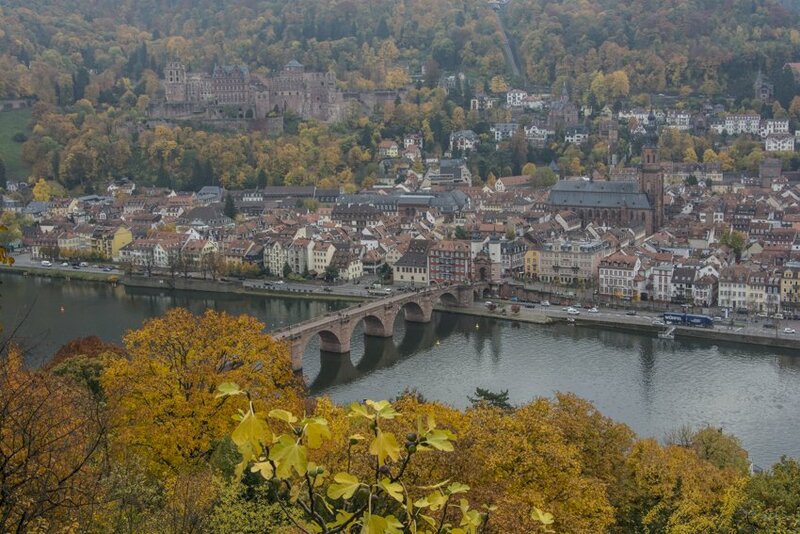 But if you ever visit Heidelberg, don’t get fooled as we did when planning the visit. We had read it was a small university town and on the map we obtained from our hotel there were just a handful of interesting sites that appealed to us. How wrong we were. We completely underestimated the charm and beauty of Heidelberg. 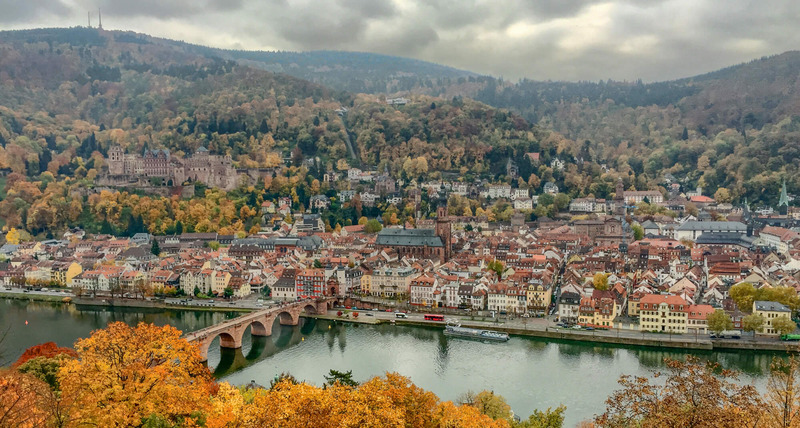 Our first plan of reserving only 2 hours for a walking visit quickly turned into 6 hours non-stop wandering up and down and left to right, and marveling at the architecture, medieval remains and stunning romantic views that Heidelberg has to offer. 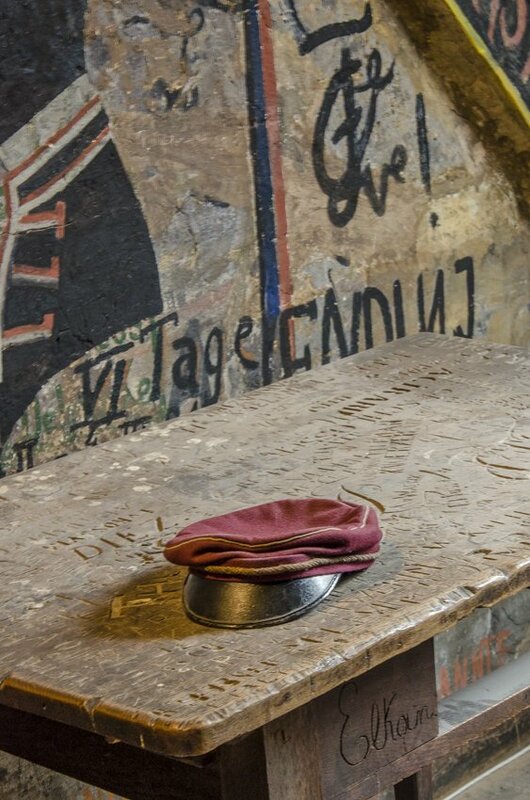 In fact, Heidelberg was spared by the Allied bombers during WWII until the end of the war, that’s how authentic and original you can expect it to be. But first things first. Our trip from Koblenz along the Rhine brought us to Heildelberg after sunset. 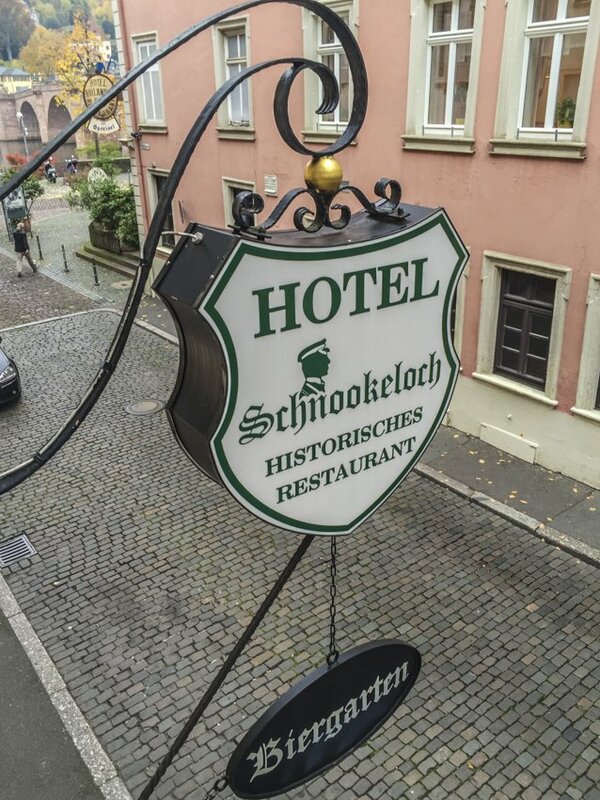 Good thing was, we had booked a hotel in advance for the night, Hotel Schnookeloch, a recently renovated affordable hotel a few steps from the Marktplatz (market square). 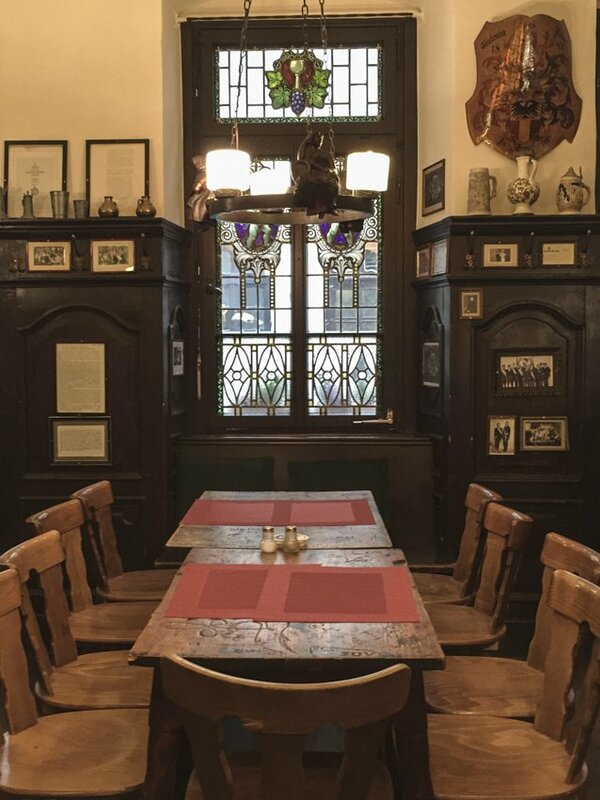 The rooms are very big, comfortable and quiet and the breakfast room is furnished with antic Bavarian decoration (coats of arms, old pictures, engraved tables with names of visitors…). As a bonus, it is situated literally 2 steps away from the old bridge and some 10 steps to the cathedral. Aren’t those enough reasons to pick a hotel? After breakfast the following day, during which we chatted with two Canadian ladies who were fellow travelers, we decided to start visiting Heidelbeg from the heights. The fortress Heidelberg (Schloss Heidelberg) albeit in ruins in many parts, dominates the hillside above the town still today and the red sandstone of its walls complemented the autumn colors of the surrounding forests. 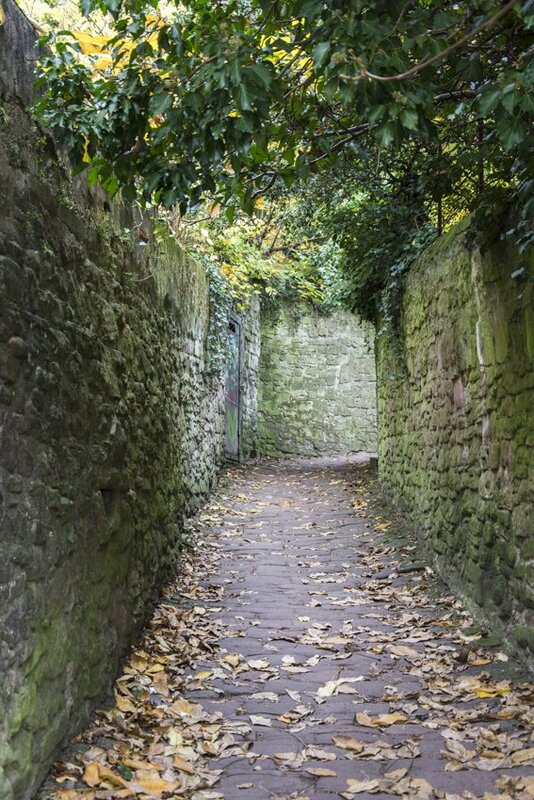 I would highly recommend that you walk up, especially in autumn. However there is a funicular if you don’t feel up to the 10-15 mins walk up. But this is not the only lookout with excellent views over the romantic town. You can get an even better perspective of the city from the North side of the river Neckar following the so-called Philosophers’ Way (Philosophenweg in German). The only way to get there is by walking up a winding, cobble stoned laneway that starts just as you cross the old bridge (Alte Brücke) to the North. Even though we worked up a sweat, the walk through the Philosophenweg was well worth it! 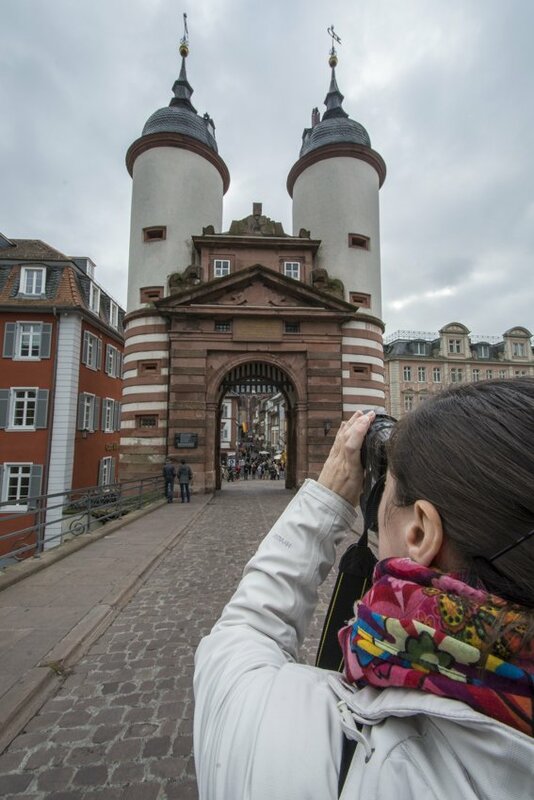 As you come down from the Philosophenweg and cross the Alte Brücke back into town, don’t forget to admire the Old Bridge Gate for more great views of the city. 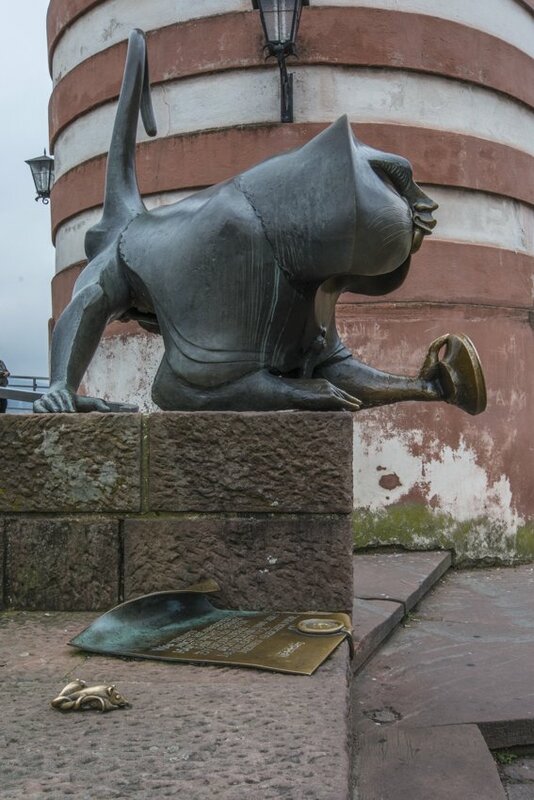 And don’t miss the monkey at the South entrance of the bridge (on the old town side). Go ahead and rub the well-worn fingers of the monkey if you want to come back to Heidelberg, the mirror in its left hand for wealth and the little mouse on its right for fertility. Michelle and I had a go or two for wealth and definitely for the come back, and we decided to leave the mouse alone till next time :-). 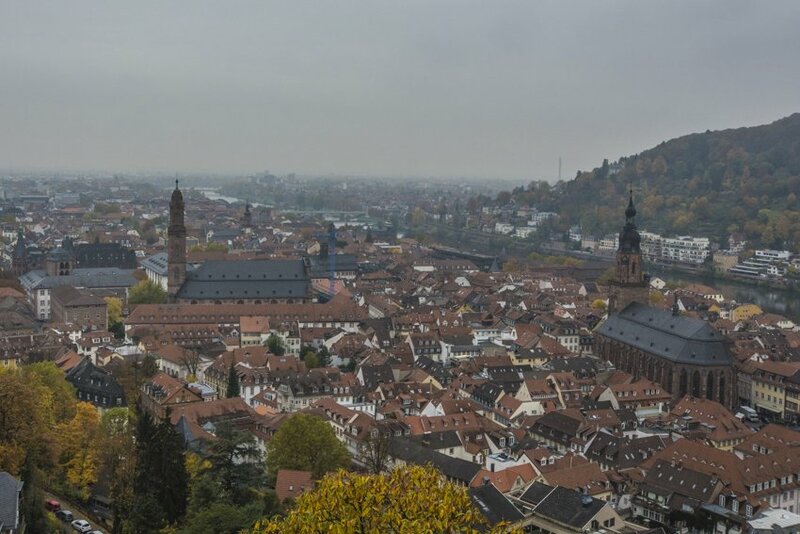 The old city of Heidelberg is easily walkable and most streets are exclusively pedestrian. If you visit in a week day out of school holidays, as we did, you’ll be immediately surrounded by students going and coming as you walk from the Marktplatz along the Main Street (Hauptstraße) towards the University Square (Universitätsplatz). Once at Universitätsplatz, we couldn’t help visiting the Studentenkarzer or the Student’s Jail right behind the Old University building. I can here you saying “What?! A jail for students!?”. But wait, it gets better! 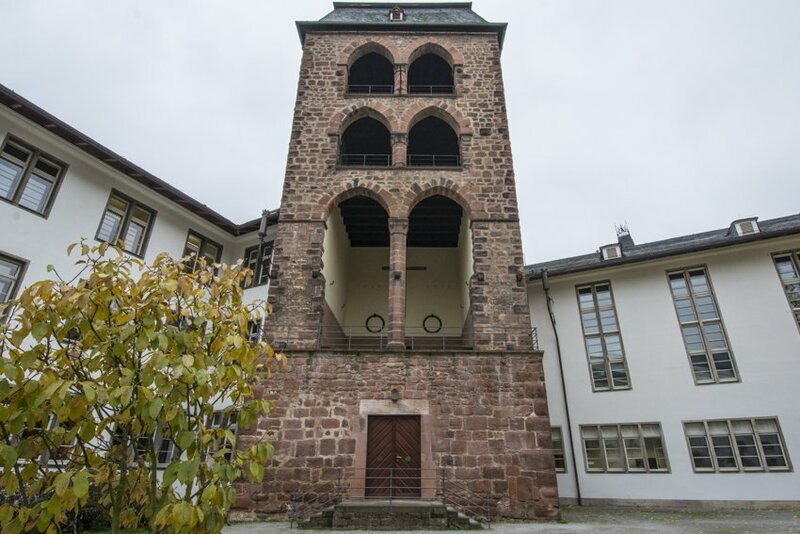 If you had been a student in Heidelberg between 1823 and 1914, the university authorities could have incarcerated you for offences such as being a bit of a drunken nuisance or making fun of the city constables. The seclusion period could be anything between 2 days and 4 weeks depending on the seriousness of the offence. For the first 2 days of sentence, the offending students were only given bread and water but then after that food and even beer could be brought in from outside. 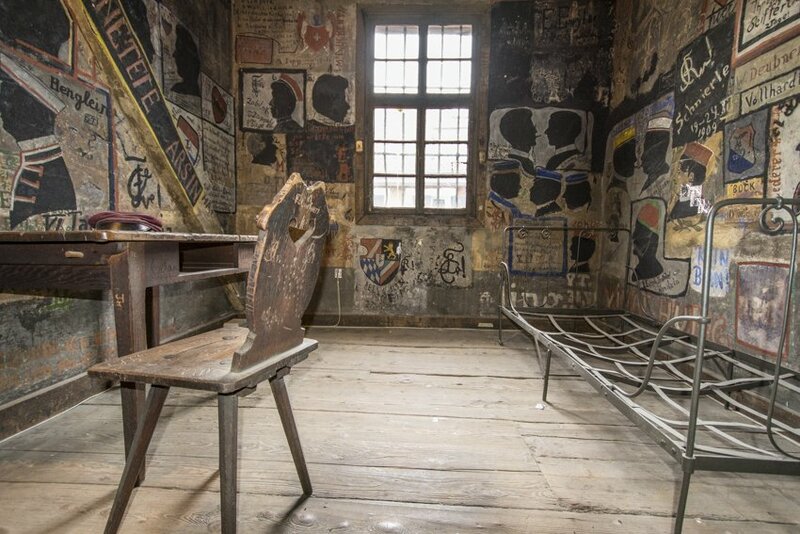 And during the whole stretch the inmates were still allowed to attend lectures as the prison was accessible directly from the old university building. 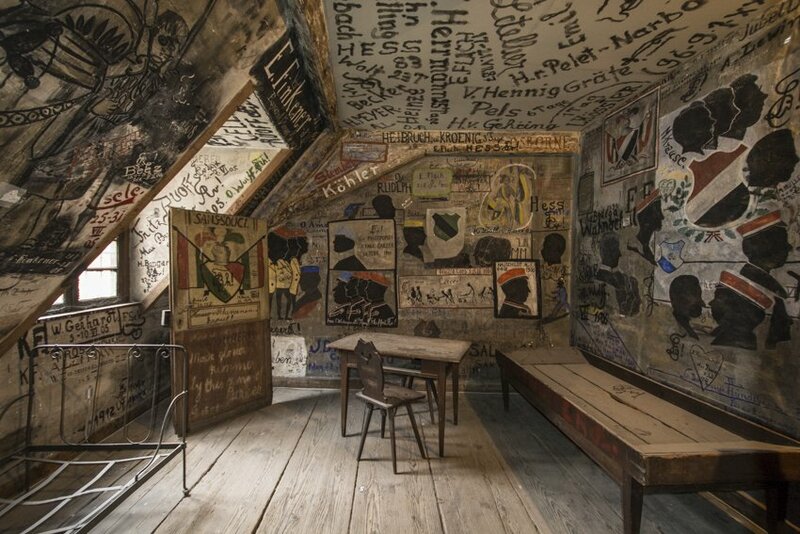 With time, a stay in the Studentenkarzer became a badge of honor, hence the students who went through this experience spent their jail time immortalizing themselves on the walls and furniture of the cells. All walls are still today covered in pictures, comments, poems and names of the lucky ones who served time here. Again, the €3 entrance fee is completely worth it, and as a bonus it also includes access to the university’s Old Hall (Alte Aula) and the university museum. This time we chose to skip the museum but decided to keep the Alte Aula in our plans. To gain access to the Alte Aula we had to go to the university museum where a lovely old man guided us upstairs with the key to the Hall. We felt like we were on a private VIP tour!. When our guide (we like to lovingly call him Hans for now, as we didn’t get his name) opened the door, it took our breath away. There was an air of greatness and grandeur about the room even though it was not massive in size. The smell of old wood and mustiness invades your nostrils immediately. 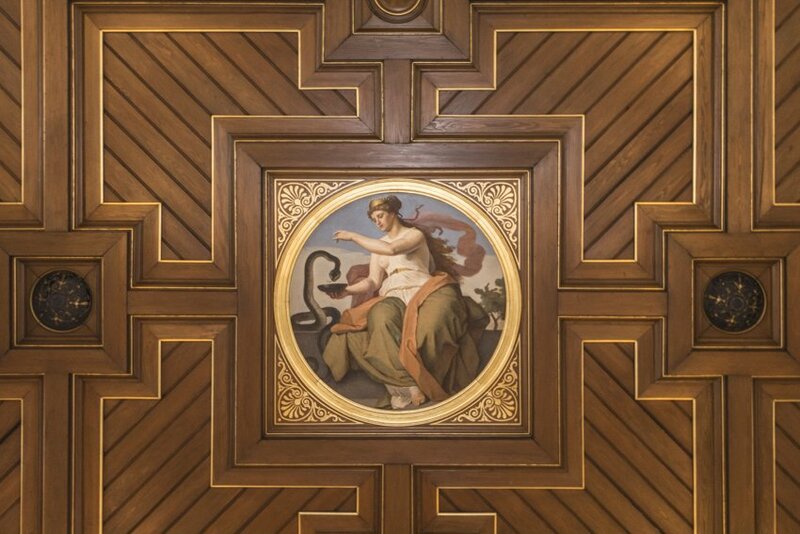 Ceiling detail at the Alte Aula. This image symbolizes the university faculty of medicine. We could easily imagine professors and students dressed in their gowns and mortar boards hundreds of years ago. 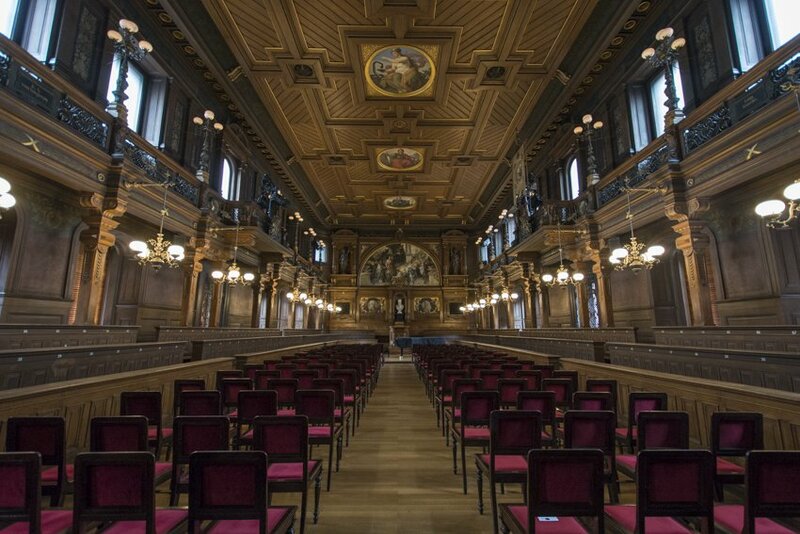 Even though the university is over 600 years old the appearance of the current great hall was created in 1886. We were the only visitors there and we could tell that our Hans was waiting to proudly tell us all about its history and decoration. Once we started asking questions, his eyes lit up and he eagerly provided us with loads of interesting facts that helped us to understand the whole meaning of this room. Another stunning old university building that impressed me is the old Universitätbibliothek, at barely 200 steps from Universitätsplatz. This majestic building houses the university library still today, with a multitude of students going in and out most of the time. Also, not far from there, in the yard of the new university we found the Hexenturm (The Witch Tower), which was part of the city fortification until the late 1300s. 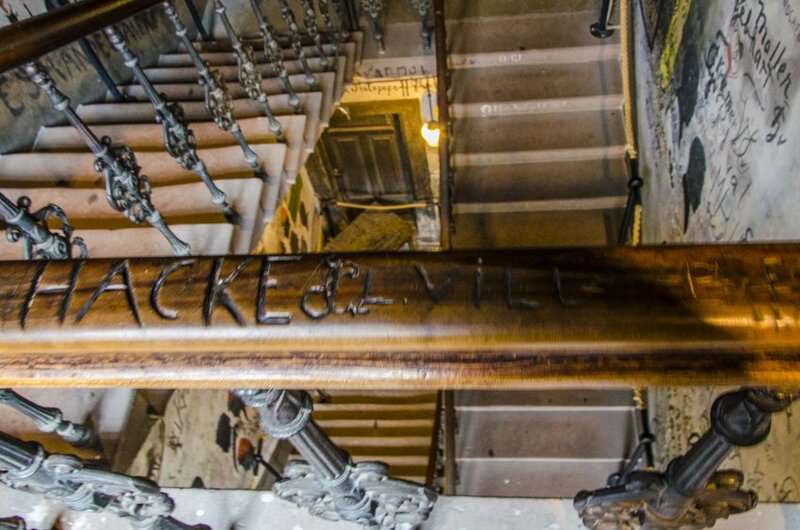 It was originally used as a jail for thieves, and later as prison for those suspected of witchcraft during the late 1400s. I was impressed to know that this tower is still today a reminder of the cruel and brutal witch hunt times of Heidelberg. 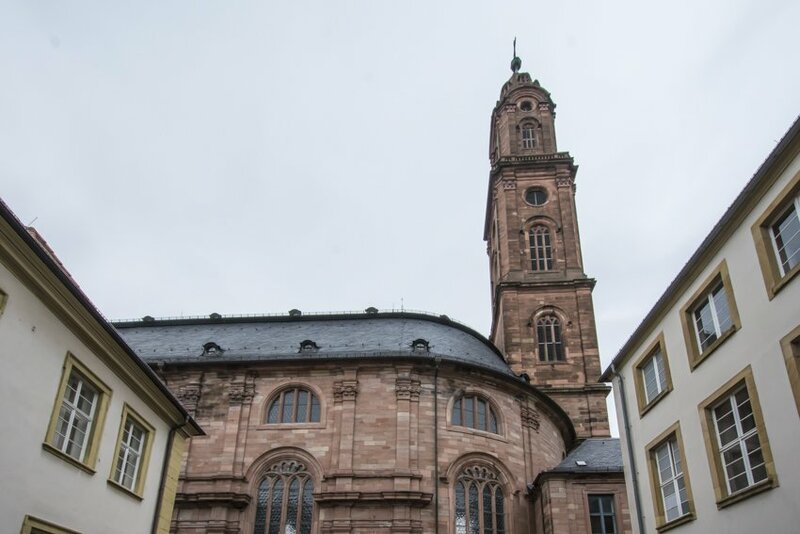 Also in the area, the Jesuitenkirche (Jesuit church) was a target for our cameras. I don’t know what it is about churches of all faiths, the architecture of the temples is most of the time impressive to say the least, and we cannot help taking a multitude of pictures of them. In this last trip around southern Germany we came back home with hundreds of pictures of churches alone! Of course, after a long 6-hour walking tour around Heidelberg, we needed some refreshment. If you’re in the area and are up for some fast indian food, you can head to Raja Rani (Friedrichstrasse 15). They offer cheap, quick but good and spicy Indian food with an extensive menu. And hey, all of the students filling up the place during lunch time cannot be wrong when it comes to cheap meals, right?! Here is another recommendation from us. Heidelberg in a day (or more if you can) is essential and not to be missed if you’re in the neighbourhood. If Mark Twain fell prey of the town’s spell, why wouldn’t you? Have you been to Heidelberg? What are you impressions? Would you like to visit this authentic old university German town? Tell us all about it by leaving a comment, we would love to know! After Heidelberg, it was time for the most romantic town of the list, Rothemburg ob der Tauber. You can read all about our impressions and tips and tricks in our post about this surprising town here. Do you want to see more pictures of our road trip? Head to our gallery here and enjoy!